His Touch Holds Her Captive. . .
From the ravens circling its spires to the gargoyles adorning its roof, Blackberry Manor looms ominously over its rambling grounds. And behind its doors, amid the flickering shadows and secret passageways, danger lies in wait. . .
To His Every Dark Desire. . .
Evangeline Pemberton has been invited to a party at the sprawling estate of reclusive Gavin Lioncroft, who is rumored to have murdered his parents. Initially, Gavin's towering presence and brusque manner instill fear in Evangeline. . .until his rakish features and seductive attentions profoundly arouse her. But when a guest is murdered, Evangeline is torn. Could the man to whom she is so powerfully drawn, also be a ruthless killer? This isn't the first story I've read by Ms.Ridley - and it certainly won't be the last! 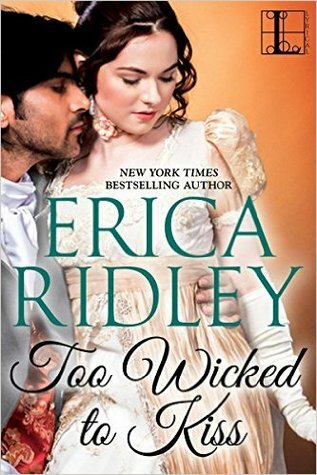 Each story I read by her gets better and better, and Too Wicked to Kiss kept me absolutely captivated. This was however the first novel I've read where the heroine is clairvoyant, so it was interesting to see how she used her "gift" to help people (at first), and then almost horrifying to see how people kept trying to use that against her for their own gain. In fact, that gift and the exploitation of it is one of the reasons I enjoyed the story as much as I did. Some of the characters are a bit too "over the top", but somehow the author made it not only work, but work in such a way that once the killer was revealed, I found myself sitting there with my mouth hanging open trying to figure out how I didn't see that one coming! Overall - I was intrigued enough by this story to continue on with at least the second one in this series, and I would recommend this novel to anyone who either is a fan of historical romances, enjoys a good "gothic" style romance, or who doesn't mind a bit of the "unknown" playing a factor in their stories.